Concrete is an enduring and structurally significant building material. Strong, stoic and impressive, concrete dwellings have an air of importance about them, all the while imparting rigidity and magnificence. Like robust fortresses or citadels, these properties exude strength and are available in a range of different styles. Today’s feature is definitely a standout domicile, and one with plenty of surprises. 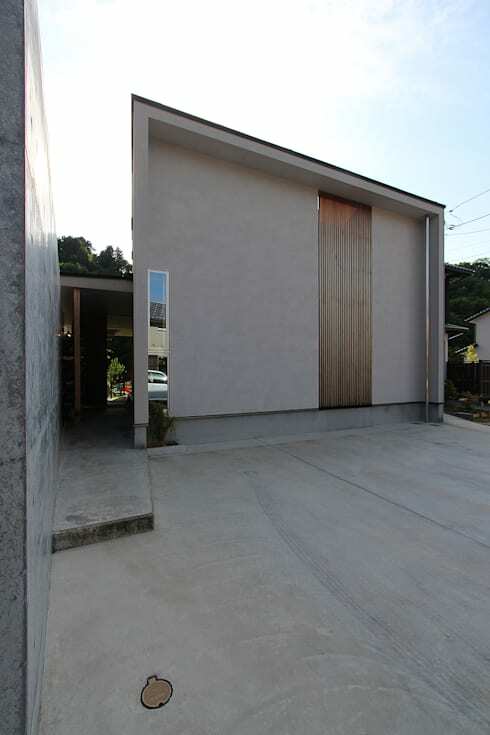 Designed by MAG + Tetsuya Miya, this cubist dwelling is dynamic, stark and striking. However, it is what lies behind the front façade that truly amazes. Along with a contemporary concrete frontage, the interior is almost rustic in its approach, with simple, modern and characterful touches. 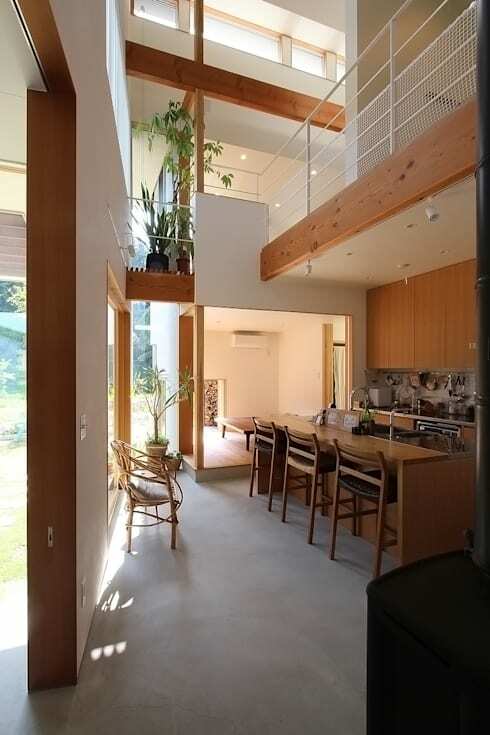 Ideal as a family abode, this house is sure to impress and delight. Take a peek below. We start our tour outside in the back garden of the house. From this vantage the property actually looks rather warm and inviting, with less of the concrete aesthetic, and a more hospitable ambience. This is in part due to the use of timber cladding, which intersects the grey concrete façade, softening the monochromatic vibes. There is a small garden that has been set up for the little ones, while providing plenty of space for adults to entertain, rest and relax. 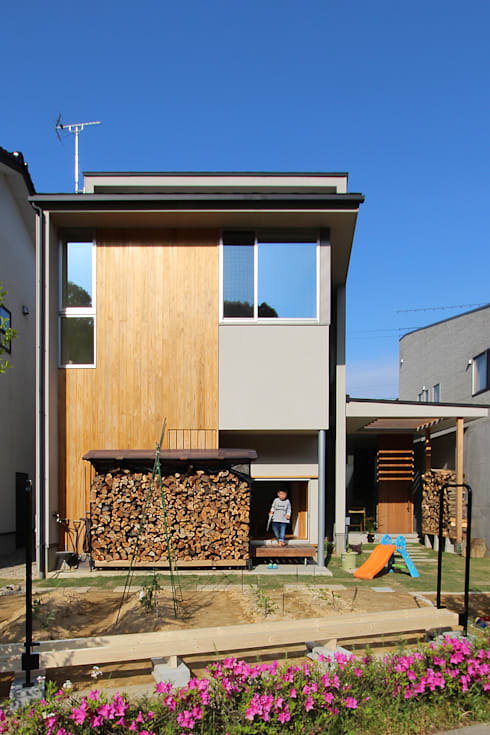 Conventional, yet with unique features, the house is definitely an eye-catching abode that suits its occupants to a T. Stacked timber gives us an idea of the interior, indicating there might be open wood burners, along with a cosy, welcoming residence. Heading around to the front of the home and we see a very different picture. The stark monochromatic façade makes a statement with its striking grey stucco, while the timber cladding is carried through with a sleek panel that offers an interesting departure from the rendered wall. A thin glazed section sits to the left of the main building, and is the only window at the front of the home. Unlike many of the more traditional homes in the neighbourhood this property is progressive and rather eccentric in its minimalism. Heading towards the front door (left-hand-side of the above image), we notice that the entrance is actually set back quite far from the street. 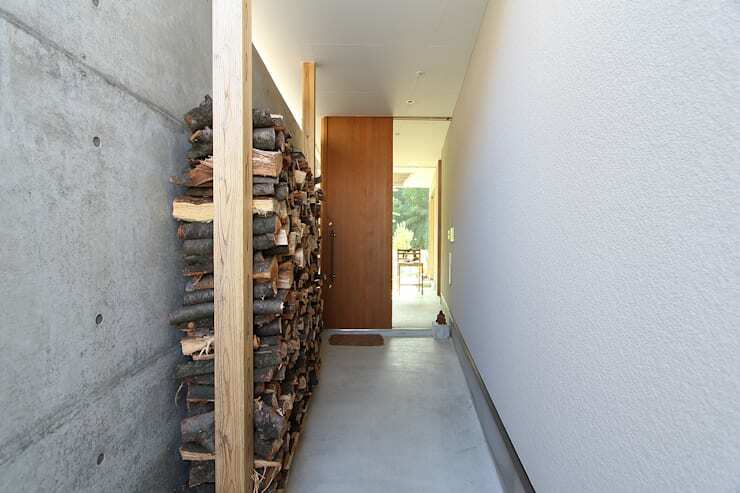 This increases privacy, and houses a handy storage space for additional firewood. Inside the décor is warm and inviting. Unlike the stark façade that we saw previously, this room is light, bright and family-friendly. In fact, the whole home is remarkably friendly, with a sense of cordiality and affection. Facing the opposite direction we’re privileged to see the almost triple-height spaces that the architects have included throughout the main family and living area. This brings a hugely capacious ambience, which not only looks fantastic but transforms the building too. Making the most of the space the designers have included surprising features throughout the abode. In the cosy hallway and lounge we see the white walls fitted with high-tech accessories that look excellent, and save space. From the upstairs mezzanine level, we notice the architects have included some handy features that add style and pizzazz. 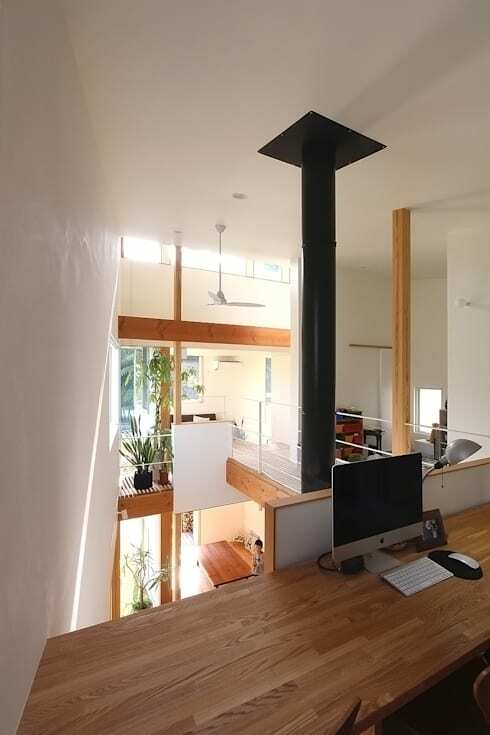 The home office and workspace is one of these, and it sits seamlessly upon a large timber panel. 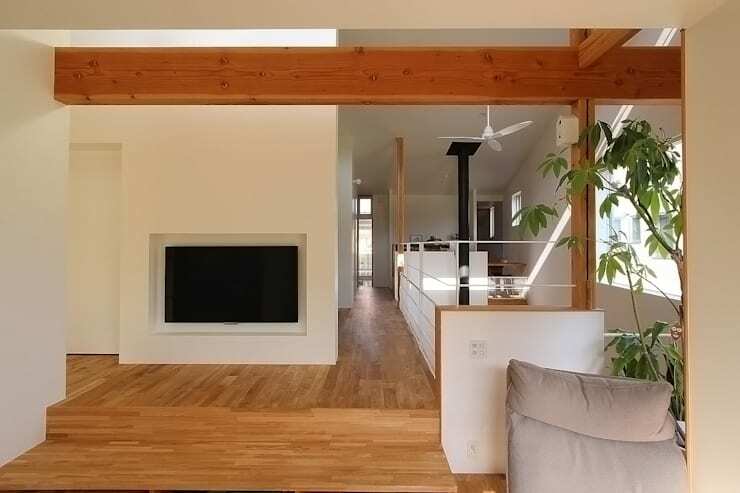 From this space the occupants also enjoy the resonant heat that comes off of the wood-burner chimney, heating the upstairs level with ease. The bathroom is the last space we take a peek inside. 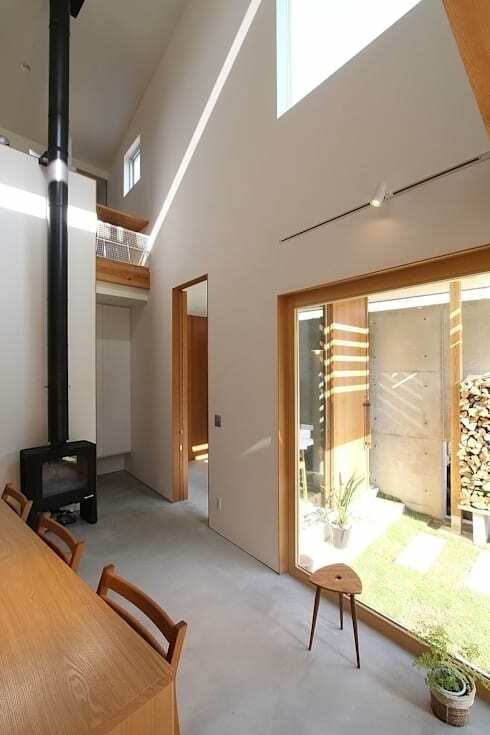 Not to be outdone by the other areas of the house, this large and impressive room includes a sauna-esque aura thanks to the timber-clad walls and ceiling. 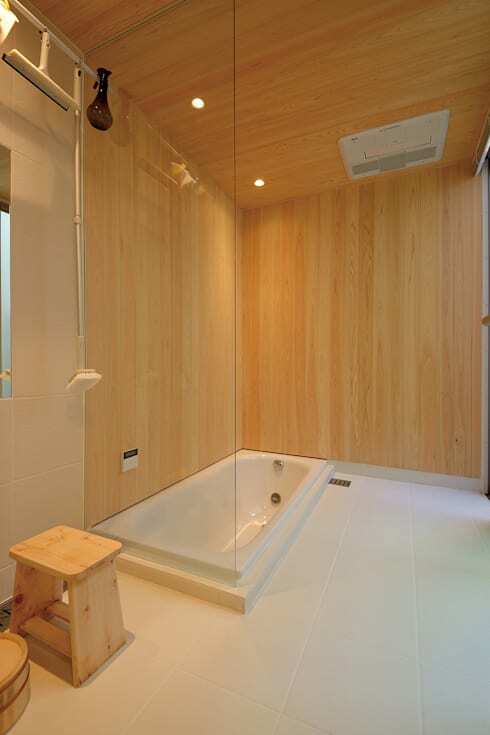 Floored with crisp cream tiles, this wash space also includes a recessed bathtub that allows individuals to sit within the room’s floor, while enjoying the steam. Do you like this home's combination of rustic and contemporary?